Ahhhhh the fruits of summer have arrived here in Oregon! 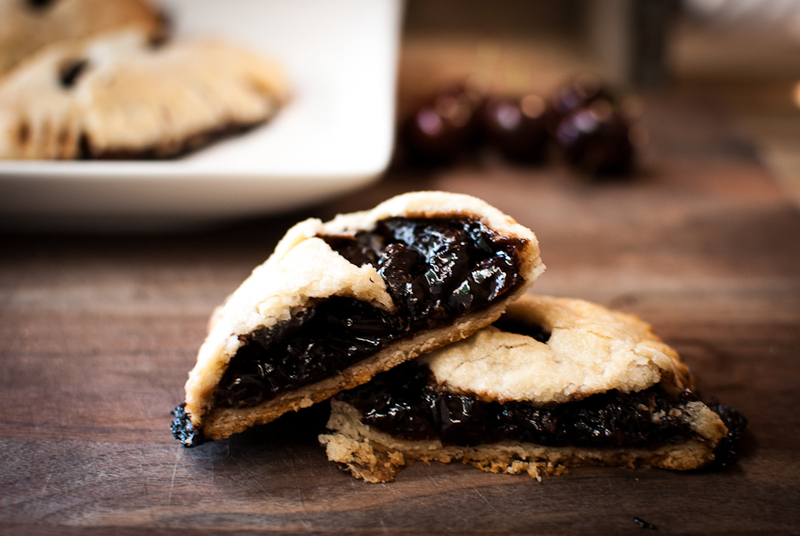 Cherries are a classic, especially the cherry pie! It screams summer is here, there is always at least one or two at a BBQ and always made for the 4th of July holiday. 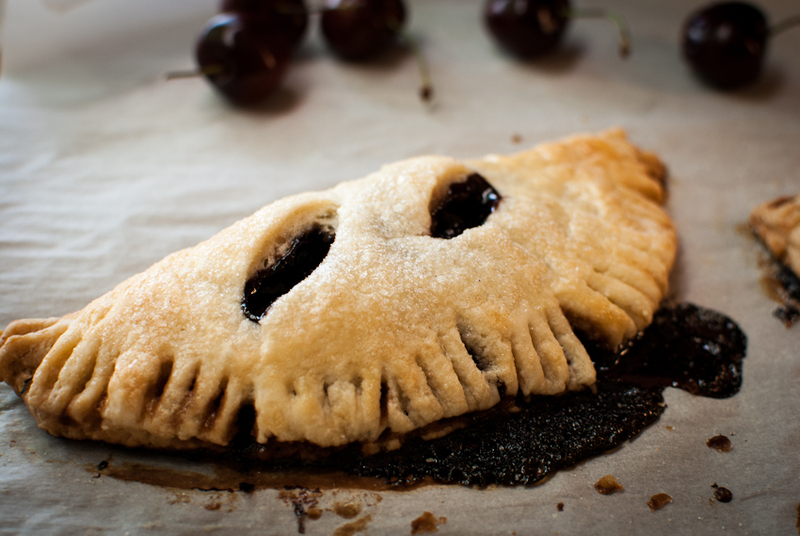 I have never made a cherry pie before, I know can you believe it? I’ve tasted many, but never jumped in and baked one. That was until I saw this recipe in the Dahlia Bakery Cookbook. 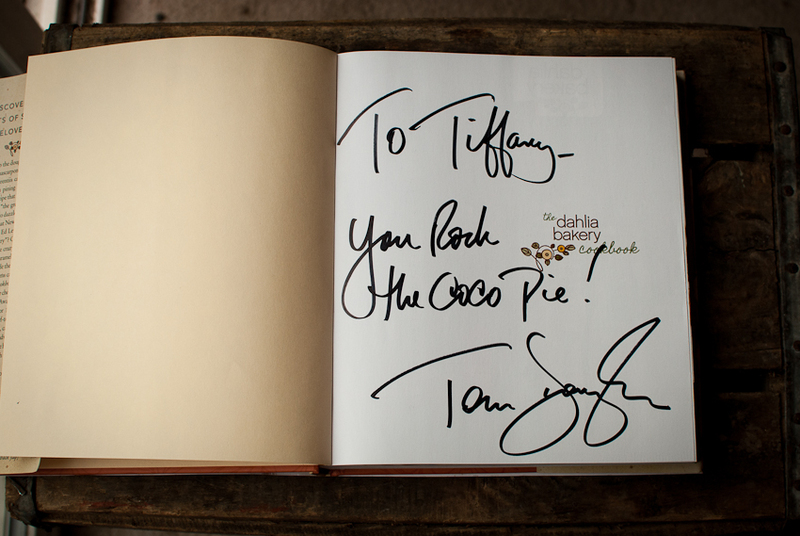 Flashback about 4 months ago- I had the great opportunity to meet Tom Douglas at a cooking demo in Portland. Yes, I was star struck, and have had my eye on his cookbook ever since I set foot in his bakery in Seattle. It was truly amazing, each person in the crowd got to taste each dish he was cooking. And of course he was signing books! He signed mine….”Tiffany, you rock the coco pie”! His Dahlia coconut cream pie is what stole my heart 4 years ago, and I still talk about that pie. OMG Amaaaaazing! If you get the chance while visiting Seattle, stop by his bakery, pick up some treats and then go buy his book! I learned the hard way, more like very time consuming way, that a cherry pitter is a must! If you don’t have one, then ask your friends to come over and help you pit the cherries. It took me about an hour and some stained red fingers to pit about 2 pounds of cherries. Just convince your friends that these pies are worth the trouble over, and hey- ask them to bring a bottle of pinot noir too! Some of the filling will ooze out when baked, and that’s ok. Just take care when filling your pies that you don’t over fill them to much. These are time consuming to make, so make sure you set aside at least a few hours. The pie dough needs to chill before baking, and the filling needs to be reduced from the cherry juice and wine. It’s not as quick as a regular pie, but the end results are amazing! You can’t rush good things, you just can’t! Unwrap the rectangle of chilled dough, and divide into 8 equal pieces using a knife. Pat each portion into disks, then roll out on a floured surface with a rolling pin. Roll into circles about 1/8 inch thick. Place on parchment lined sheets. Split vanilla bean lengthwise and scrape out the seeds. Set aside. Place the sugar in heavy saucepan, and cook over medium high heat until sugar turns an amber color. Remove the sugar from the heat, and carefully add 1/4 cup of the wine. The mixture will splatter so be careful. Add the cherries and cook over medium-high heat until they are soft and the juices have released. Remove pan from heat, using a slotted spoon, scoop out the cherries and place in a bowl. To the cooking liquid left in the pan, add the vanilla bean scrapings and the pod, the star anise and the remaining 1/4 cup of wine, and the dried cherries. Cook at medium heat until the liquid has reduced to about 2 tbsp, and reduced to a syrup consistency. Remove from heat and add to cherries in the bowl. Add the cornstarch and vanilla extract, stir to combine. Chill mixture in the fridge for about 20 minutes, when cooled remove vanilla bean pod. Brush some starch water around edges of hand pie dough, place about 1/3 cup of filling in middle of each pie disk.. Fold the top part over in half, and seal the edges, crimping with a fork. Repeat until all pies are filled. Brush top of each pie with cream and dust with sugar. Cut slits in the top to let the steam escape.Put sheets with pie dough back into the refrigerator and chill for 30 more minutes before baking. Bake pies until golden brown and bubbly, about 50-55 minutes, rotating pans half way thru. 1 C ( 2 sticks) of unsalted butter, cut into 1/2 inch pieces and placed in the freezer for 30 minutes. In a food processor, put flours, sugar, and salt in the bowl and pulse a few times to mix. Add the cold butter and shortening to the dry ingredients. Pulse several times until the mixture resembles the size of small peas. Add the ice cold water and vinegar while pulsing. Dough should be sticky but not form a ball. Remove from processor, and wrap to chill until ready to use. 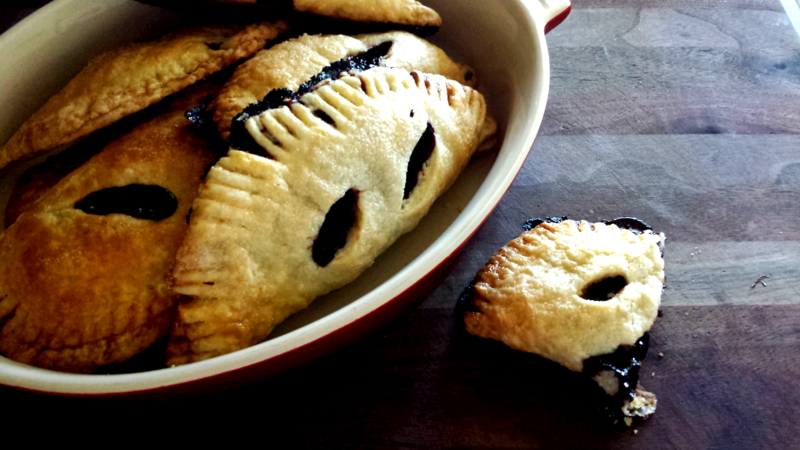 I love these hand pies! 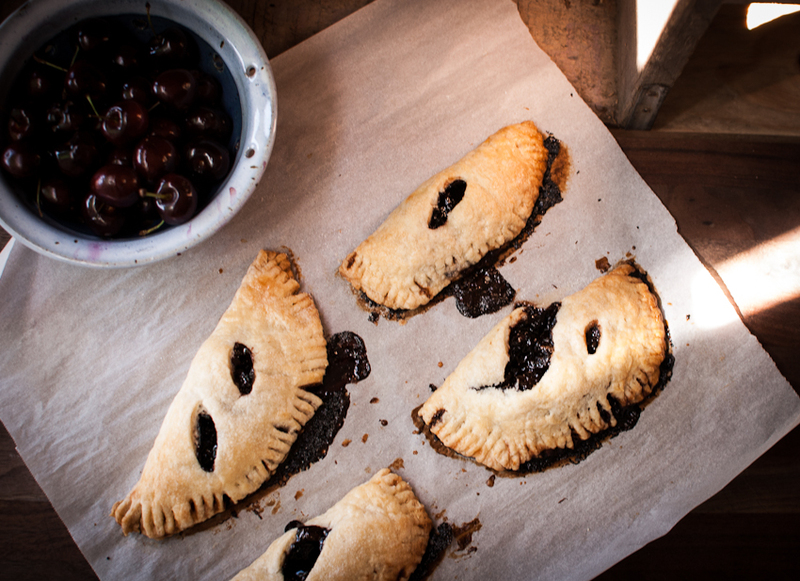 I made strawberry hand pies last month and they’re a new favorite for me and my husband, I’ll have to try to make these, cherry and pinot noir? yum! They look great! 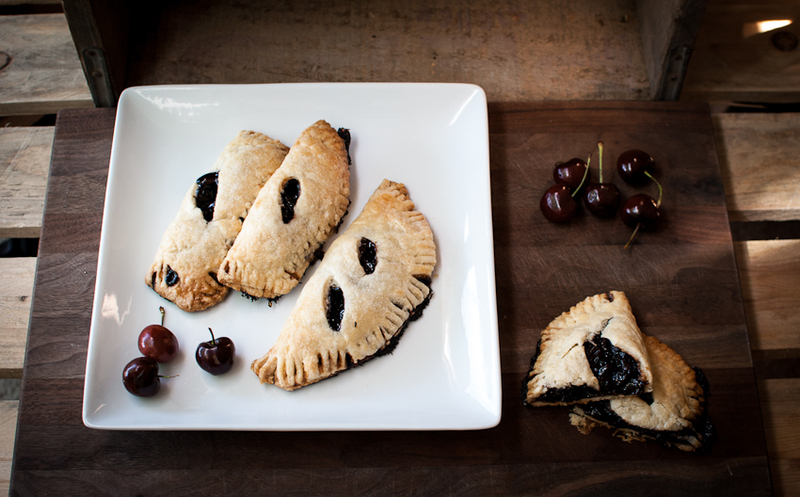 Your hand pies look tempting. Thanks for posting this recipe.